The Ice Path is very slippery in places, making your progress very difficult. Study the maps closely to make your way through the slick maze. 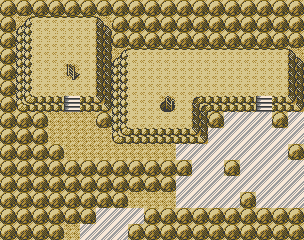 You will also need a Pokémon with Strength to move boulders around so that you can continue on to Blackthorn City. You got a taste of this in Pryce's Gym, but progressing past this ice field is a heck of a lot tougher. When you step on the ice floor of the path, you won't stop until you've hit a wall or a rock. It can take some planning and logic to get to where you want to go. With enough trial and error, you should be able to make your way to the right. 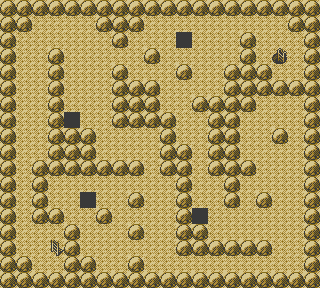 The map shown to the right is for Gold and Silver. 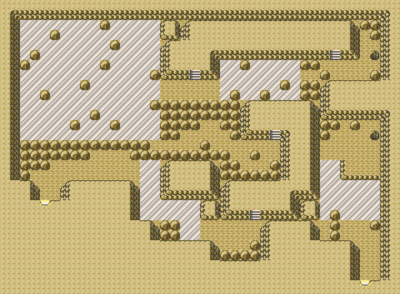 The correct path across the ice has been altered in Crystal. 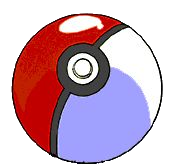 The name of this location describes the types of Pokémon which can be caught here, most importantly, Jynx. You need a strong ice type for the upcoming Gym and also the Elite Four and Jynx is a good choice here, with moves Ice punch and also Powder Snow available at lower levels with each level up she gets more and more powerful. After you pass the first slippery floor, you will see an item on the ground to the far right. At the end of the second ice puddle is HM 07, Waterfall, a technique that lets your Pokémon travel straight up waterfalls! It's essential in several areas, including Whirl Islands, Mt. Mortar and many other places. You can't beat the game without this move. 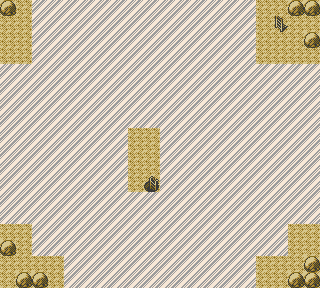 You'll need to use Strength to push the rocks into the holes, dropping them down to the second basement level where you can use them to slide over to the stairs. They will give you stopping places on the large, icy floor below. 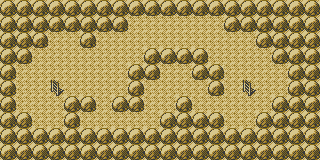 Once again, the map to the right reflects Gold and Silver; the arrangement of the rocks has been altered in Crystal, although the position of the holes, and subsequently where they land below, remains the same. 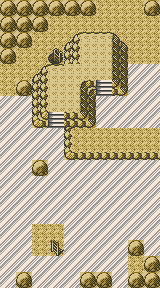 After snagging the Nevermeltice in the third basement level (which powers up Ice-type moves), jump off the ledge just south of the right set of stairs to slide into TM 44 (healing move Rest). A hidden Ice Heal can be found on the block in the middle of the ice patch (just go up to it and press A). A hidden Max Potion can be found on the block located in the middle of the ice field. (Just press A when facing the block). You will return to the right side of the beginning of the Ice Path. You only only steps away from Blackthorn City. Don't miss the PP Up item on your way out (and an extra Protein item for Crystal players). Jynx are all female, but if you breed them with a Ditto or a Kadabra or something, they can give birth to a new Pokémon. Raise that Pokémon for 37 levels, and it will learn new moves like Psychic that Jynx couldn't otherwise learn. It's a lot of work, but egg-raised Jynx are powerful. Still, definitely catch one here in Ice Path. Swinubs are Ground and Ice-type hairballs with really dismal stats. But when they evolve into Piloswines at level 33, they get much better (you'll need to evolve them at that level, or Piloswine will never learn Fury Attack). Swinub and Piloswine both learn good Ice moves, but nothing in Ground. Not everyone knows quite what to make of this bizarre, present-tossing Santa Clause bird. It's Ice and Flying-type, but its only technique is Normal-type Present, which does a random amount of damage, but sometimes heals your opponent. It can learn some TM's (and Fly), but its stats are pretty poor. It's more of a novelty Pokémon. In Gold/Silver, you couldn't get Sneasel until the very end of the game. Now that you can get it very early in Crystal, as your first Dark-type Pokémon, Sneasel is worth using. Faint Attack is a great Dark-type attack, especially with Sneasel's high Speed. Unfortunately, Sneasel doesn't learn any Ice attacks. This page was last edited on 20 October 2018, at 22:25. This page has been accessed 417,576 times.